Welcome to week one of June! As we said in the May newsletter, we’ve been super busy here at CSE, especially as we get closer and closer to the start of Beta 1 on July 4th. While we’ve gotten over all the major hurdles of GDPR work last week, we have had to do more work this week, and will need to work on it next week as well. The upside: all of our CSECitizens’ data is safer and more secure than ever. The downside is that we took a major hit to our productivity in terms of making the game. As of today, we are now at over 400 man hours, and more to come this week. While we’re still on track for the start of Beta 1, we’re now just barely on that track. Therefore, the team here will be making sure every hour counts in order to come into Beta 1 strong! To reiterate from last week: If you missed our livestream with Mark and our lawyer Jim covering how GDPR affects CSE and our Backers, you can find that HERE. If you haven’t updated and accepted/declined our new policy, please log into your account HERE. (https://api.citystateentertainment.com/Account/Login ). You will be presented with the information immediately upon your first login if you have not accepted these terms. After that, you can still review or change your acceptance of the policy HERE (https://api.citystateentertainment.com/Account/PrivacyUpdate ). As MJ always says, we have to do things the right way, even if other folks don’t. And that will never change. Additionally, if you missed this week’s wrap-up and Q&A livestream with Ash and George from our satellite office near Seattle, you can catch that HERE! Let’s move into our highlights for the week, which at fifteen items is really strong for a four-day week! WIP – GDPR / Forums: This week, continuing the never-ending drain on resources that is otherwise known as the GDPR, we took further steps to protect personal information on our servers. We’re currently in the process of upgrading the forums software to make them compliant with privacy settings and store as little personal information as possible. There is ongoing work on the store to re-enable upgrading and combining of pledges and redemption of gift codes. We’re also updating our support tools to work with the recent privacy and security changes. The bad news is that we have passed 400 man-hours on this, but as of this morning, we are still on-track (albeit barely) for Beta 1 on July 4th. WIP – Tech – Building Mode: Matt is currently focused on getting blueprints working again so that our resident builders can create new buildings for the home islands. While working on this, he’s getting in some quality-of-life fixes by removing some old band-aids in the code. This will get us easier code to work with, and a better user experience. Tech – Plot Control: This week, Christina focused on landing several changes that were in progress last week. This includes the use of plot deeds and more options in plot permissions, such as sharing building capability on your own plot with others within your faction. Tech – Cross-Server Scenario Matchmaking: Colin landed his changes this week, allowing Backers to queue for a scenario from different zones. The next phase will be to get this into the hands of Backers and address feedback. Colin is also updating the code supporting players transitioning between zones when traversing the world. WIP – Design – Progression: Ben spent most of the week deep in the progression system, working with Christina. He’s setting up ability components to gain experience and level up. Christina will be working to automate this process during our next sprint. WIP – Tech – Audio: This week, Dave followed upon last week’s audio format changes. This includes editor changes to improve quality-of-life support for dB, as well as support for the new information we’re passing about the world/combat state. This will allow us to effectively LOD sound, and address a number of long-standing audio bugs. Tech UI: AJ wrapped up his trade window work, which is going into review shortly. Overall, this version is far better than dropping an item on the ground so someone can pick it up! He’s currently working on improvements to API queries to improve performance of things like the results screen at the end of a scenario. WIP – Skills Debugging: In preparation for Beta 1, Rob continues to audit the various skills to make sure the VFX, SFX, and overall functionality is in a good place. Multiple times this week, he’s been spotted asking “Does anyone need something fixed? Is anything not working as expected with skills?” Suffice to say: Mike, Ben, and dB love Rob! WIP – Art – NPC Greeters: Joe finished weighting all the NPC clothing for one greeter male or female for each Realm, and is currently importing these so they can be equippable items. Sandra is already using these items for the characters’ animations. Once in, we can use these characters to convey useful information when wandering about the zones. 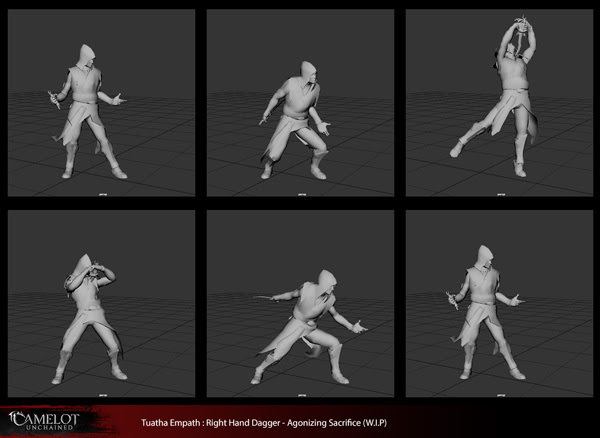 WIP – Art – Animation: Scott is currently working through the Empath’s new animations, having finished a pass on the updated idle and special ability, which now both use a dagger. Sandra has knocked out the NPC greeter idles, and should have the interaction animations wrapped up shortly, before moving back to the Physician’s class-specific needs. WIP – Art – Icons: After a quick detour to get married and a honeymoon, James is back finishing up the trait icons today, and starting on the new icons for equipment we’ve added to support the changes in class animations. Congratulations, James! WIP – Art – Home Island Environment Art: Dionne finished up some additional grass assets this week, and began work on a TDD boat, which will populate our docks. 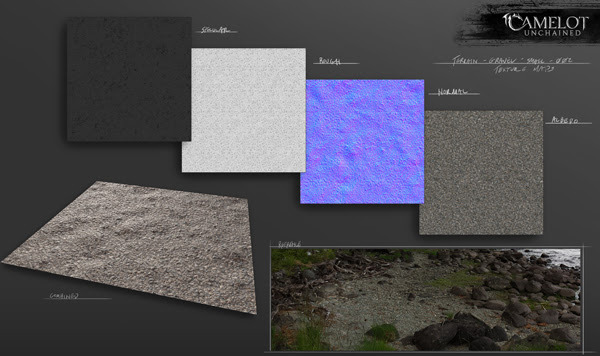 Tyler created several new terrain materials this week, and began working on the home island layout with Michelle. WIP – Art – Concept: Speaking of Michelle, this week she focused on layout ideas for the home island, particularly strengthening specific views and assisting with ideas to make the island feel inhabited. She is also working on Realm-specific signage concepts for the tavern and banks. Art VFX: Mike is wrapping up the VFX update to the Mjölnir’s special ability today. Scott recently rebuilt this animation with its own unique class idle. The new version, with Mike’s VFX, is looking really solid! Art – SFX – Abilities and Scenario Results: With Rob’s help, dB is working on hooking up sounds to parts of abilities that previously did not work, particularly the Stonehealer. He’s also working on hooking up the Victory and Defeat music at the end of a scenario. Lots of good progress this week! As we come into the home stretch here, you will notice more and more items finishing up features ahead of feature lock, plus lots of bug and polish work. Let’s move on to some of the art from this week, starting off with a still image of some of the blocking Scott is working on for the Empath’s special ability. For the start of Beta 1, each class has a primary weapon. The Empath now sports a snazzy dagger! Instead of just waving his hands about to transfer health from himself to his ally, he now actually wounds himself first. Once Scott gets farther along, we will upload an animation. Scott livestreamed this work earlier in the week, which you can find HERE. Now that James is back in office, he got back to work on new icons for traits. 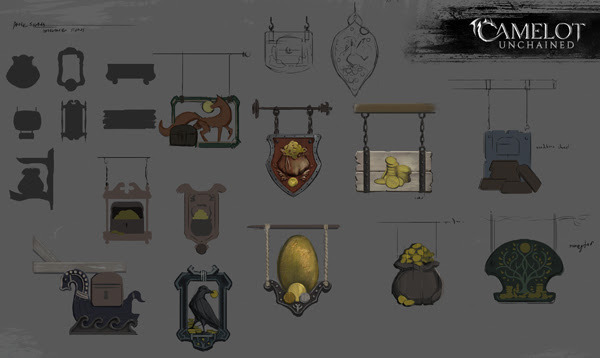 Below, we have some of Michelle’s concepts for Realm-specific tavern and bank signage. 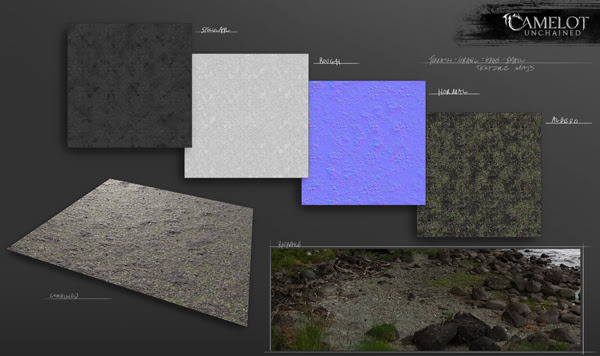 Using pictures from Andrew’s trip to Ireland, I (Tyler) created several new materials, two of which are gravelly ground, to re-create this rocky shoreline pictured below. Final color and tweaking will happen once everything is assembled in the terrain system in the game. If you missed my environment art stream from yesterday, you can catch that HERE. Right before the storm took out the power in the office, Michelle and I turned on the mic to talk about how we were approaching some of the layout work. Scroll to the end to catch that part for our “colorful” dialogue! 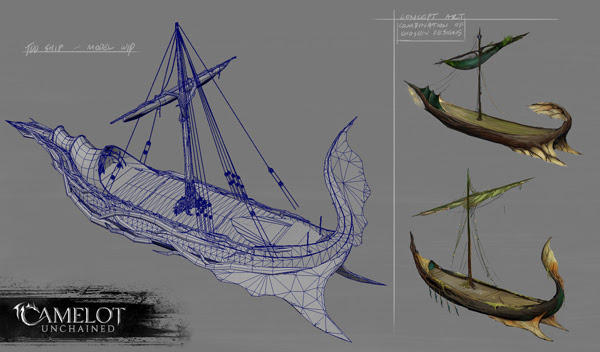 Next up, we have a wireframe of the work-in-progress TDD boat from Dionne, with the concept art from Michelle for comparison. Next week, we’ll have some materials on it! That wraps up art for this week. I (Tyler) personally am very excited to continue working on the islands, so maybe this weekend I’ll get some time to further flesh out the assets needed for that shoreline! 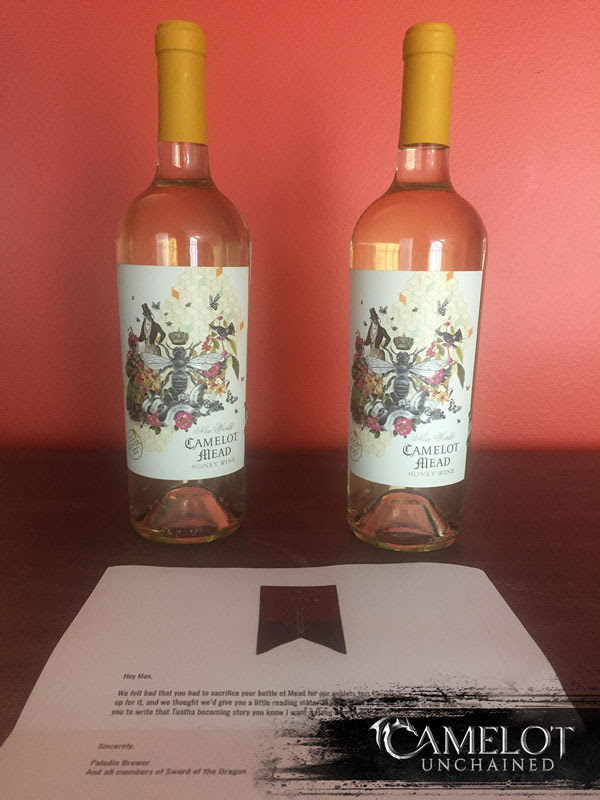 Special thanks to Paladin Brewer and the members of Sword of the Dragon for this great gift of Camelot mead, along with a book and note! We’ll make sure and enjoy this thematic beverage at the end of the day! 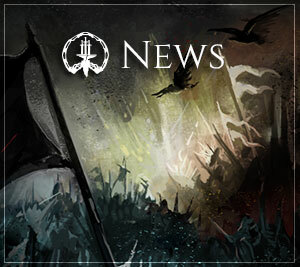 Thank you very much for joining us this week, whether it be on stream, reading the monthly newsletter, or reading this update. We truly appreciate the enthusiasm, patience, and good will from our Backers. All of us at CSE know this is a special project, one which continues to drive our efforts to make a great game. We’re looking forward to the journey with you, all the way from Beta 1 to launch and beyond!